I have always loved this style of anklet. I have heard them called anklets, barefoot sandals, foot laces and foot thongs. Anyone know what the real name for these are? 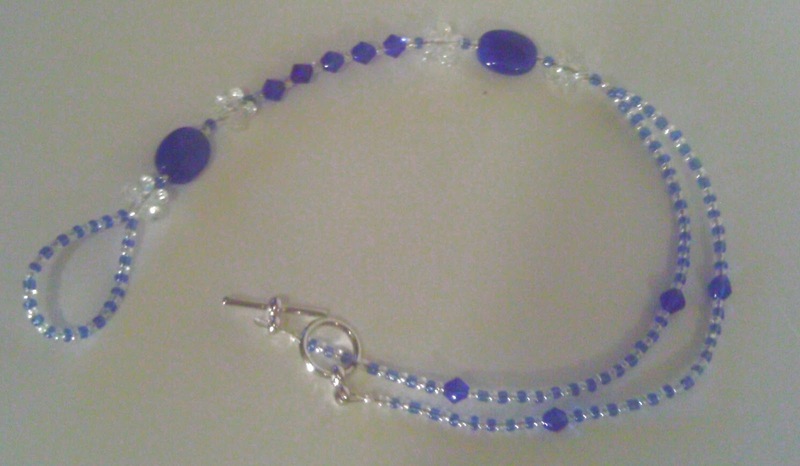 This anklet was handcrafted using blue and clear seed beads, blue oval disc beads, crystal flower beads, and blue bicone crystals. I never really wanted my feet on public display, but here it is! 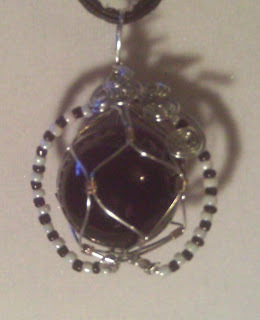 When I first posted the Amethyst in Pears necklace, I had mentioned having to restring it 3 times. Well I wanted to give a little history on the making of this necklace. When I pictured this necklace I saw the drop beads laying flat with a nice flow, just below the collar bones. Well, it seemed that I kept crimping the beads just a little too tight so that some of them kept "popping up" instead of laying flat. On the third restring, I thought for sure I had it right. I was off by about 1/16 th of an inch. Just one single bead kept popping up! GRRRRR! 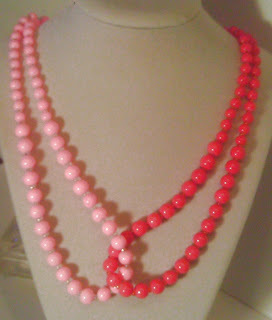 Well, I thought maybe I could stretch the necklace just a wee bit and then the bead would lay flat. Finally, the fourth restring was a success! 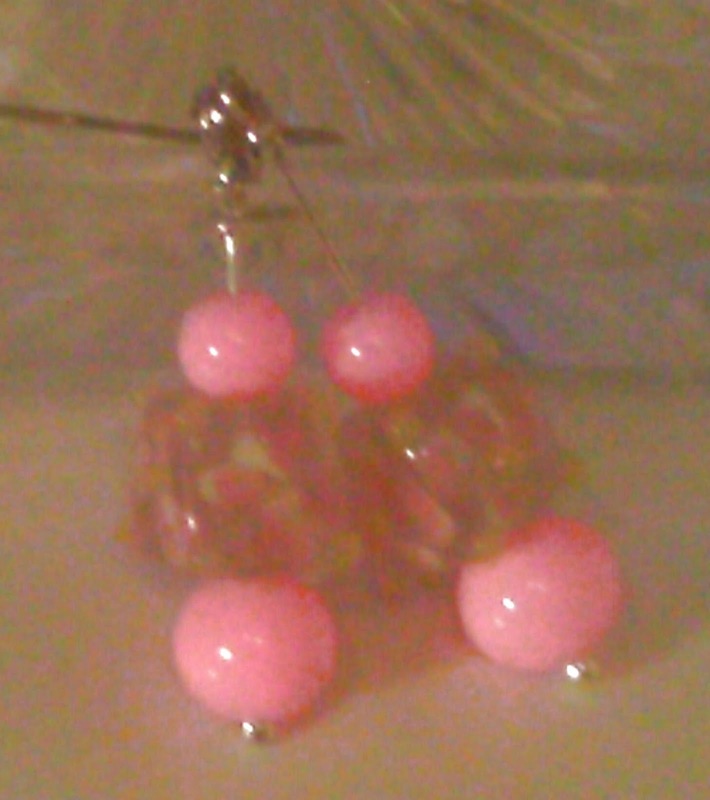 Went to WalMart last night and saw some pastel pink glass pearl beads and some cute cube lampwork beads with little pink flowers and Easter popped into my head. So, here is what I made for Easter. First is a necklace. 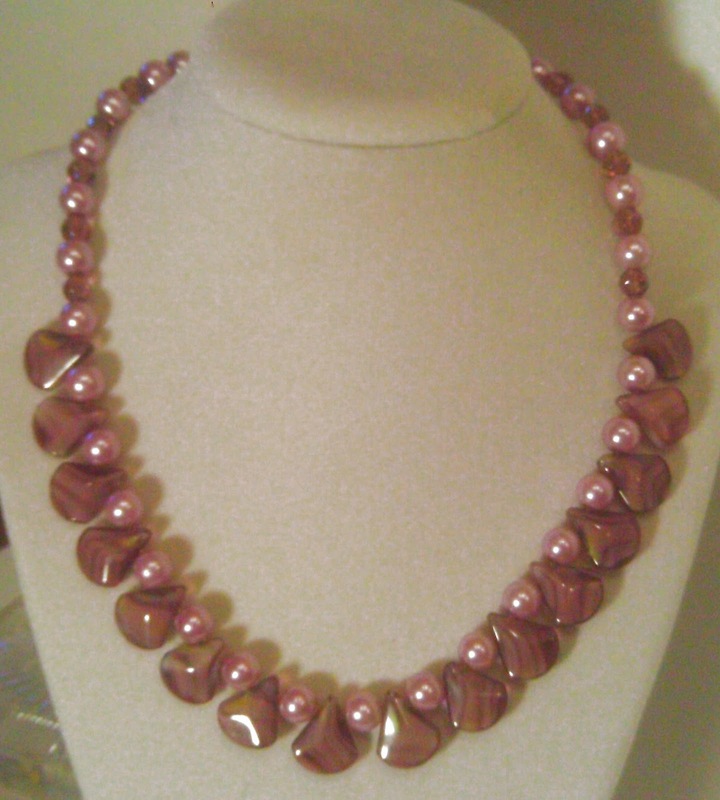 This was handcrafted using the pastel pink glass pearl beads and some other of the same type of pearl beads that already had but in a darker, almost hot pink. This necklace is kind of like two necklaces in one. And, here are the Easter earrings which use the pastel pink beads and the cube lampwork beads. Hmmm....think i need to take some more pics of the earrings. 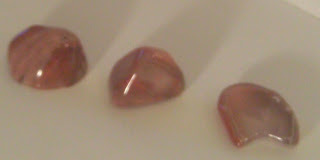 These don't show the lampwork beads too well. 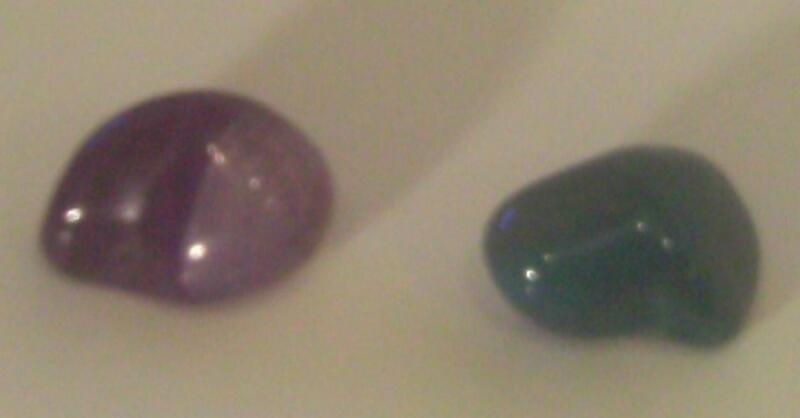 The first one is a necklace I call Amethyst In Pearl. 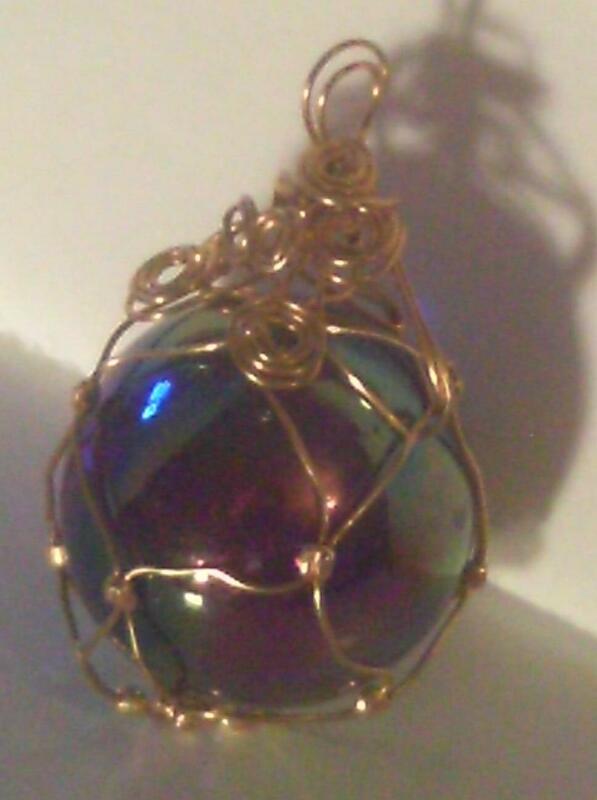 It is made from Amethyst drops, light violet pearls and Amethyst crystals. Had to redo this one 3 times because I kept getting the ends crimped a little too tight and the drops wouldn't lie flat. I almost gave up on it! It was definitely getting frustrating. 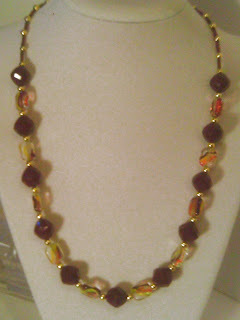 This next necklace I call Chocolate Persuasion. I guess because the faceted beads remind me of Chocolate candies, lol. 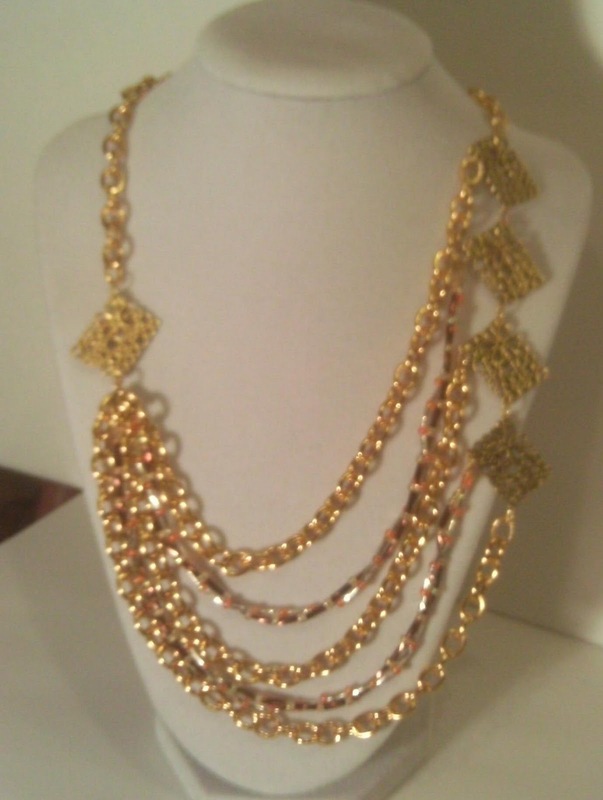 This necklace is handcrafted using chocolate colored faceted beads and window beads with swirls of chocolate brown, yellow and orange. 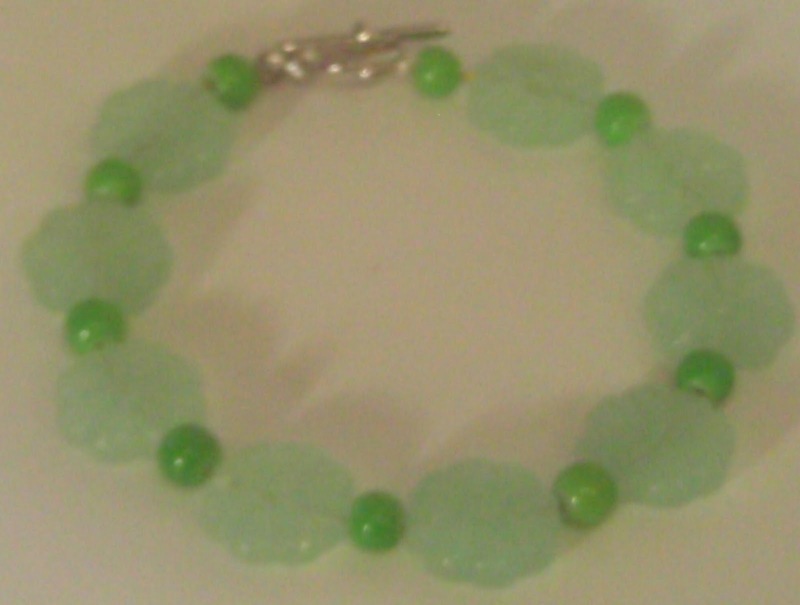 And, last but not least is a bracelet. 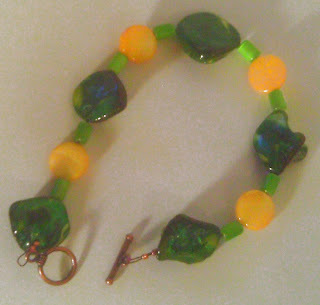 This might be a little colorful for some, but was having a hard time finding a place for these Mother of Pearl beads. This handcrafted bracelet has green Mother of Pearl beads and yellow Mother of Pearl coin beads along with glass tube beads. And, there we have it! 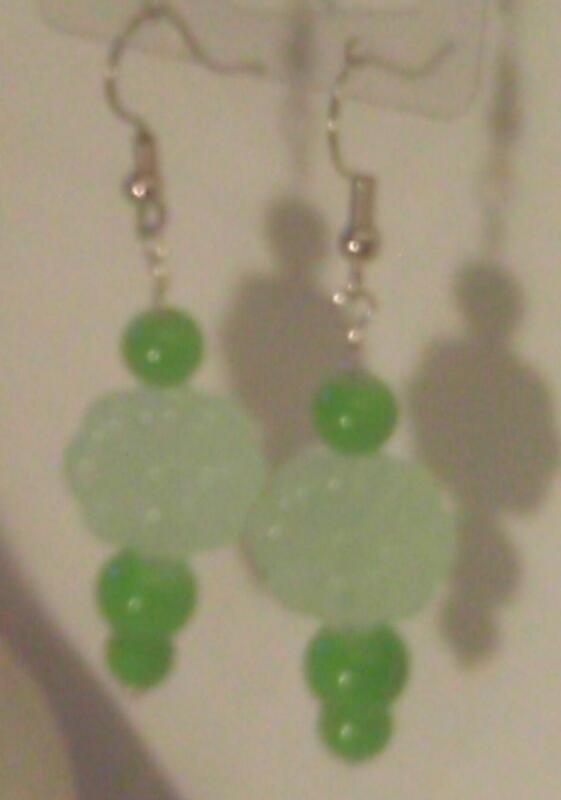 Completed this set last night using light green glass flower beads and glass pearl beads. Perfect for Saint Patrick's day. I went to our local fair yesterday and in the "Gemstone" building, I purchased a grab bag. I realize that most Jewelry Artisans know a least something about gemstones, but being someone who always loved handcrafted jewelry but couldn't afford the high-end prices, I decided that my handcrafted jewelry was going to be affordable for those, like myself, that can not afford the high-end prices. therefore, I don't work with gemstones a lot. Well, at least not this type. 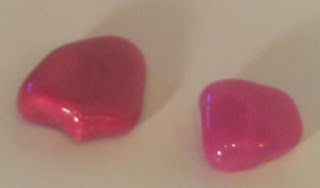 I do know what types of gemstone beads I use because it is usually on the package or in the description when I order them, lol. Anyway, being somewhat clueless as to the stones I got in my grab bag, I am hoping someone out there might be able to identify them for me. I would be truly grateful. The pics are below. I would really appreciate any help anyone could give me. Spent about 4 hours today sorting beads. My son comes into the room and knocks them all over.....EVERYWHERE! Didn't know whether to laugh or cry. What a day. Anyone want a free child? lol! What a mess, still feel like crying. Just finished this necklace last night. Got these neat filigree findings for 99 cents at Michaels! I threw in a couple strands of brown and clear bugle beads and yellow and orange seed beads. Think that brought out the whole necklace. 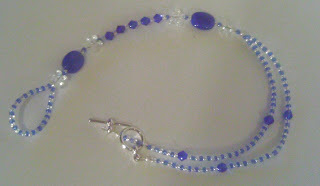 I think I am going to make a matching bracelet. This is my Snake Charmer Necklace. 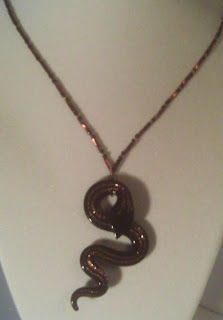 The pendant is black and metallic copper glass and the necklace is twisted copper bugle beads and black seed beads. It is on sale at my store. 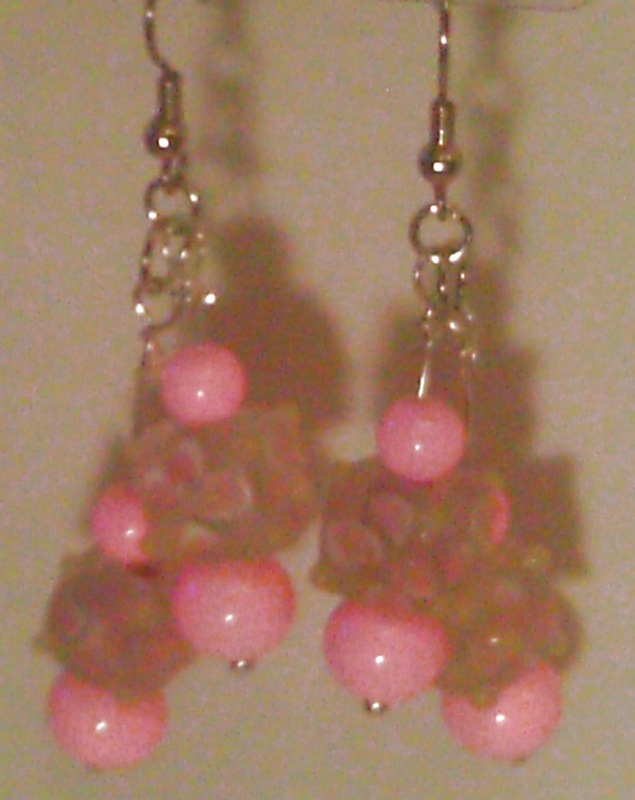 Nutkitten's Handcrafted Jewelry. This is my first attempt and wrapping marbles. Used wire and crimp beads.